In my Florida life, a seashell was a seashell. Some were prettier than others, some were larger and I just called them shells and never knew they were actually mollusks. In fact, when I found a nice shell, I never gave much thought to what had once lived inside. Mollusks are invertebrate animals and I am mostly interested in the ones that live inside their shell homes, but some mollusks don’t have shells (squid, cuttlefish and octopus). They consist of single shells that are all in one piece – gastropods or univalves, and shells that are hinged, or two pieces – bivalves. They all live in ocean water or brackish water, which is less salty as it is combined with fresh water. I mainly use the common names of the shells when describing them, but the scientific names are important in identifying seashells and each shell will have a two-part name. Always the scientific name is italicized, with the first part being capitalized and the second is not. Below is a beautiful Knobbed Whelk shell. Search as Busycon carica. And read more about this one on my blog post. When reading the descriptions of a gastropod on a more scientific site or in my seashell ID book, I learn about the spire (top part of the shell), whorl (the way it twists), aperture (opening), lips (edges of the opening), canal, and operculum which seals the “door” when the animal retreats inside it’s shell. 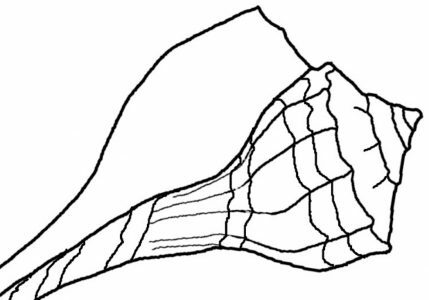 The bivalve descriptions could include describing the umbones, ligament and hinge teeth. Most descriptions will include colors and characteristics unique to that shell and the inside color along with the size and where it can be found. Once you know this, you can speak seashell too.